Limited Edition. Price £795.00 + FREE Mainland UK Delivery. Only one person - the Dom Pérignon cellar master - can decide if and when to re-release a vintage - granting it the "Œnothèque" (Wine Library) label. The "Œnothèque" label indicates that the vintage has reached either its second peak in maturity, with optimized intensity (15 to 20 years after harvest), or its third peak, with optimized complexity (after 30 years on the lees). A coppery pink colour with glints of coral. On the nose, the top notes of dried herbs immediately give way to candied citrus peel, the whole complemented by toasted, smoky accents and hints of cocoa. In the mouth, the attack is open, airy and caressing. The wine’s intensity gradually makes itself felt and carries on, holding the penetrating sappy note. The launch of Dom Perignon Rose Oenotheque 1992 is a perfect opportunity to reveal more about Dom Perignon Rose, the jewel of Dom Perignon. Its rarity is linked to the very few vineyards that can offer Pinot Noir grapes with sufficient maturity: mostly south-facing sites in Hautvillers, Ay and Bouzy. In some particularly warm and sunny years, other vineyards can also contribute, but this is the exception rather the rule, much as Dom Perignon Rose itself. Dom Perignon didn’t start pushing the envelope recently: taking risks and embracing challenges has always been at the forefront of our philosophy. Combining Dom Perignon’s singularity and the characteristics of the vintage is already a tour de force. Inviting the richness and intensity of the Pinot Noir to shine through the assemblage, yet retaining Dom Perignon’s elegance and ability to withstand time is a paradox in itself. This feat was first achieved in 1959, with this visionary first vintage being revealed twelve years later during the 2,500th anniversary of the foundation of the Persian Empire. 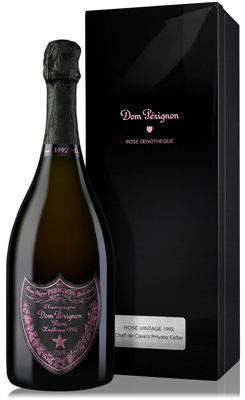 863 magnums of Dom Perignon Rose 1959 were served for only this occasion, and it remains to this day among the most exclusive wines in the world. Dom Perignon Rose is understandably created in even fewer vintages than Dom Perignon Vintage: no Rosé was released in 1976, 1983 and 1999, whereas (paradoxically) 1986 welcomed a Rosé but no Blanc. The introduction of Dom Pérignon Rose Oenotheque several years ago was another tribute to the longevity of Dom Perignon.